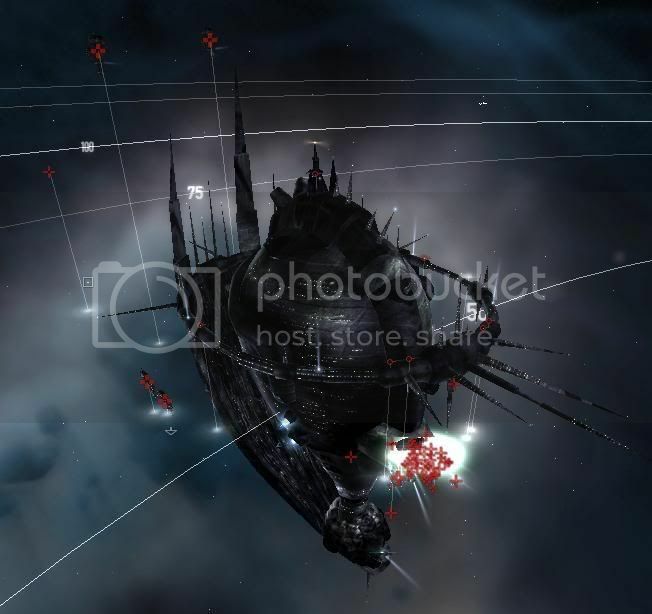 4 Battlecruisers and 4 Battleships are present around the Battletower at 50k from warp-in. Immediate aggro. Each cruise missile battery spawns a Centum Loyal Slaughterer/Execrator when destroyed. Mission is flagged complete when the Battletower is destroyed. There are no prisoners to return despite what the mission states. The incoming damage is significantly higher than in a Level 4 AE-Bonusstage (to have a comparison that is familiar to many mission runners), but this mission can be completed solo in a T2-fitted Raven. However I had to warp out 4 times in total, so better keep an eye on the scrambling elite frigs. You definitely need to deliver the prisoners to your agent to complete the mission. They take 750m3 cargo. Can confirm no prisoners to deliver, mission complete when station is down. Completed in damage fit Kronos supported by Passive Vulture Tanker plus Warfare link Vulture at Safe spot. Another mission completed with no prisoners involved. I can confirm, completed 2 times now without even looting prisoners from can. I needed to loot the Prisoners to give in the mission. Did it in a team of 2, a Drake tanking and a Nightmare dealing damage. Agent ask prisoner for completed. Looks like CCP fixed this one unless the prisioner requirement is specific to certain agents. Have run 3 times in the last couple of weeks and prisoners have been required to complete the mission. There're 2 different missions. In Aridia all 4 Amarr agents (Amarr Navy/Ministry of War) always assign you one with prisoner requirement. In Placid, Gallente agents (Federation Navy/Federation Customs) give you another one, without prisoners requirement. Minmatar recieves this mission as well as does NOT require prisoners. Agree with VaLTrantor that it could be solo'd in a rattlesnake, although you might want to take an alt along for DPS. Mine too was passively fitted, but as he says, passive fit not necessary on this one. Solo'd in an active ab tengu, took no more than 20 minutes. Simply pop the stasis tower + frigs and then the station. Definitely one of the easier lvl 5's out there. Keeping this simple. Killed Stasis Tower and Battlestation. Flagged mission as complete. Only killed frigs if they were warp scrambling otherwise no need to kill anything else. Had to pick up prisoners from can after station died.